Are My Custom Mirrors at Risk of Developing Black or Brown Spots? Brown and black spots are caused by one thing, substances seeping through the mirror backing. Those substances range from condensation and cleaning fluid to storm water and human sweat. The related stains use to occur often in the 1800s and early 1900s because custom mirror backing weren’t that strong. 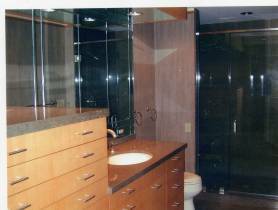 Today, many custom mirror fabricators use stronger materials that prevent seepage. As such, brown and black spots are thankfully becoming scarce. Use a dehumidifier, heater or air conditioning system to keep the indoor, relative humidity below 50% and avoid placing cheap mirrors in areas prone to developing moisture problems. 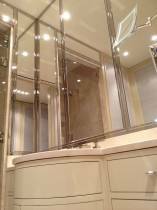 Examples include rooms with hot tubs, saunas, whirlpools, glass enclosed showers, garden tubs and lap pools. Bring your mirror to us and ask to have the backing coated with a protective material. Of course you could also try to bolster the existing backing yourself with specialty paints and films from the local craft store. They won’t be as effective as the commercial backing materials we have on hand but may do in a pinch. 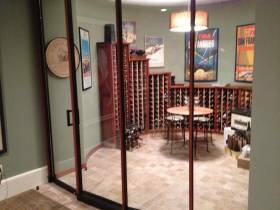 To learn more about protecting wall custom mirrors and other mirrored items from turning shades of brown or black, please contact us today. Are you space challenged? Is your living situation more cramped than you'd like, but a remodel to add that needed addition just isn't in your financial cards this year? There is another solution and an affordable one to boot. Instead of refinancing the house to redesign and build that extra space, try some custom mirrors. A large custom area mirror strategically placed can magically add on that addition simply by reflecting the room back to you, giving the illusion of space. And amazingly, when a space appears larger, we feel as though we actually do have plenty of space. Energy always fills a vacuum and if it seems as though we have ample space, we somehow function just fine within that space. Another idea to reflect your space back to you, is with colored back painted glass, or with textured or pattered glass. Full or partial wall installations of this mirrored or textured glass can result in stunning transformations of your space, rendering it unrecognizable from its former stunted views. It may not offer the storage you need, but for a quick and very beautiful fix, Hutchinson Glass & Mirror can offer some excellent mirror and glass ideas. And as a fourth generation family owned business since 1920, HG&M is the oldest, independent, glass fabricator/retailer in the Washington metro area, specializing in the highest quality, distinctive design, production, and installation of all types of glass. With a knowledgeable staff of skilled installers providing excellent service, customer satisfaction is priority. If you are ready to deal with your space challenges, contact us today for a complimentary consultation. 1. Go with groups. Hanging mirrors in groups is a great way to get the effect of a larger mirror without the price tag. The trick with grouping mirrors is to buy mirrors of different sizes and shapes, but with the same (or very similar) frames-this keeps your collection looking organized rather than cluttered and messy. Grouped mirrors also make an interesting focal point in any room, especially an entry area. 2. Work with windows. Have a small room with a window? Hang a large mirror on the wall opposite your window. This technique reflects the outdoor view of the window, almost making it appear as if the room has another window. The room will be flooded with more natural light, creating a feeling of more space. 3. Go big. If you are looking for a dramatic way to create space and make your ceilings feel higher, Real Simple magazine suggests using a mirror that is at least three-quarters the height of your ceiling. There is no need to try to hang such a heavy mirror - leaning it against the wall and securing it that way works well. 4. Try one behind the stove. A small kitchen will open up with a mirror placed on the wall behind your stovetop. We spend so much time in our kitchens standing in front of the stove, having a mirror in this spot will automatically make the room feel larger, and add tons of light to a normally dark wall. 5. Turn it. Lengthen a short wall by turning a long, skinny mirror on its side. Hang it on the wall horizontally, and you'll be amazed by how much longer the room appears. Mirrors are a fantastic solution for small, dark rooms. They make a room appear more spacious and add natural light, both of which open up your home. Please feel free to contact us for more information about using mirrors to make your small rooms feel larger. Selling a home is a delicate process that requires careful planning to do in a realistic time frame. If a home is not properly staged, potential buyers who are looking at other homes will simply choose the properties that are displayed in an appealing and organized manner. It is vital to stage the home, and one way is to invest in wall mirrors throughout the home. If you have a fireplace in your home, you can improve the space greatly by hanging a wall mirror above. The room or area of space that has a fireplace should feel warm and welcoming, and this is exactly what the addition of a wall mirror will help to accomplish. When you have a bathroom mirror that catered to your own style, which may not fall into the neutral category, your best option is to switch it out for a neutral wall mirror that allows potential buyers to visualize the bathroom being theirs, as opposed to the current homeowner’s. While a wall mirror works quite nicely by the front entrance, to achieve an ideal look, you should place a mirror above a table or tall shoe rack that is close to the front door. A wall mirror is a great way to improve the appearance, but it also makes an excellent upgrade because it provides functionality to those leaving. It allows them to look at the mirror and make sure they are ready to go outside and tackle the day. Another place where a wall mirror fits in well is above the dresser in the master bedroom. It makes sense because it is the spot where people get ready and a mirror makes it easy to fit and match properly. If you are interested in getting wall mirrors to stage your home, contact us for more information. While there are various reasons why a homeowner may pick a frameless mirror, one of them is to give their bathroom a modern appearance. It creates this kind of look, because without a frame, a mirror can look like it is floating. Although installation is a simple process for a frameless mirror, glue is the standard option for mounting to prevent bulky and noticeable hardware from needing to be used. 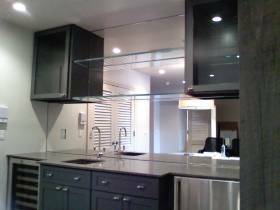 If you are not satisfied with your options for framed mirrors and frameless mirrors, there is nothing wrong with getting a custom mirror. While these mirrors tend to be a little more expensive, the benefits are also quite astounding for homeowners that want a personalized appearance. It is great because the options are nearly endless, which means you can choose from a wide variety of details and measurements. Feel free to contact us for assistance in making the right choice for your home.